Pro-life is the name given to people or organizations who defend the human rights of the unborn fully-human being, and who oppose fetal homicide. The pro-life movement in the United States has been able to save millions of human lives. "Pro-abortion" or "pro-murder" are the most accurate terms for advocates of taxpayer-funded abortion and other advantages for the abortion industry. Many state governments even pay for abortions using taxpayer dollars, usually due to a court order rather than the will of the people. Supporters of abortion rights prefer the term "pro-choice", which (regardless of the term used) means they believe the mother of a child should have the legal "right" to murder the unborn human being for any reason (they also use the term "anti-choice" to refer to pro-life individuals or groups). Due to rulings by the U.S. Supreme Court (e.g., Roe v. Wade), the United States allows abortions during the first trimester for any reason, and during the second trimester only for medical reasons (i.e. - when the life of the pregnant woman is at risk due to complications related to the pregnancy). In American politics, the Republican and Constitution Parties are strongly opposed to abortion on a moral basis and believe it should be illegal. 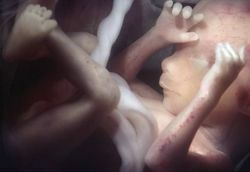 The Democrat Party supports abortion and opposes legal restrictions. Leaders in the Democrat Party, such as its presidential candidates, also support taxpayer-funded abortion. Officially the Libertarian Party supports the right to abortion but opposes taxpayer funding for it (consistent with their views on small, limited government and non-interference in personal issues), though a significant segment of Libertarians oppose abortion on the grounds that one of the (few) legitimate functions of government is the protection of citizens, and would consider the unborn in that category. Vanishingly few Democrat politicians, such as the Blue Dog Democrats, hold pro-life views, while a few Republicans such as Rudy Giuliani hold pro-abortion views. In 2016, the Republican Party adopted the most pro-life party platform in its entire history, with strong language recognizing the right to life of unborn human beings and condemning Planned Parenthood. The same time, the Democrats adopted one of the most extreme, pro-abortion platforms in its history, supporting unrestricted abortion, supporting the repeal of every single law in existence that limits abortion including those that formerly received bipartisian support, and forcing taxpayers to fund murder. Additionally, the Democrat presidential nominee Hillary Clinton was one of the strongest supporters of abortion in U.S. history. The phrase "pro-life," especially in the Catholic Church, may include other positions in defense of human life, such as opposing attempts by hospitals or hospices to deny care to premature infants or elderly patients, or to engage in euthanasia. Although rare, there are also a few Pro-life people who, in addition to opposing fetal homicide, also oppose capital punishment. Natalism is "the policy or practice of encouraging the bearing of children, especially government support of a higher birthrate." Sub-replacement levels of fertility, absent immigration, causes population decline. Some countries in order to reverse population decline offer various incentives people to have big families in order to try to reverse declining populations. For example, incentives may include: single time baby bonuses; reoccurring child benefit payments or reductions in taxes. Some countries impose penalties such as taxes on families with fewer children. In addition, some nations, such as Japan/Singapore/South Korea and Taiwan, have implemented, or attempted to implement, interventionist natalist policies which create incentives for larger families among native people. Immigrants generally are not a part of natalist policies. ↑ Byas, Steve (February 6, 2018). Pro-life Movement Saving Lives. The New American. Retrieved February 6, 2018. ↑ Ertelt, Steven; Bilger, Micaiah (July 18, 2016). Republicans Adopt Most Pro-Life Platform Ever Condemning Abortion and Planned Parenthood. LifeNews.com. Retrieved December 26, 2016. ↑ Bilger, Micaiah (June 28, 2016). Democratic Party Platform Calls for Forcing Americans to Pay for Abortions. LifeNews.com. Retrieved December 26, 2016. ↑ Ertelt, Steven (October 19, 2016). Hillary Clinton Defends Killing Babies in Partial-Birth Abortions: “Government Shouldn’t Step In”. LifeNews.com. Retrieved December 26, 2016. ↑ "Pro-natalism: Breaking the baby strike". The Economist. 25 July 2015. This page was last modified on 27 January 2019, at 21:09. This page has been accessed 69,248 times.